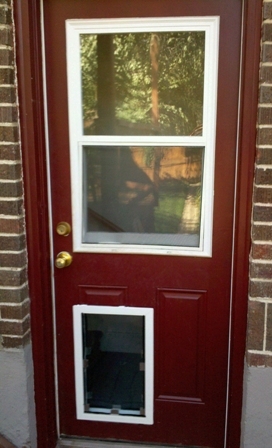 At Mile High Dog Doors, I offer pet door installations just about everywhere in your home or business. I’m authorized and trained by Hale Pet Door, and I guarantee that your pet door installation will be completed according to the Hale Pet Door Customer Bill of Rights. Hale Pet Door has the most inclusive warranty in the pet door business, so you can be confident that your pet door is the highest quality pet door available. I can install your in glass pet door through just about any single or double pane glass for the clearest view possible! Do you want your pet to use the same entrance that you use? I can install your pet door in a door: metal door, wood door, fiberglass door, raised panel door, French door (true multi lite), storm door, crosshatch door-- both interior and exterior. Do you want your pet to have access to the outside through a screen? I can install your pet door in a screen: just about any screen window, door or screen room to give your pet free access to the outdoors while you enjoy the good weather. Is the best place for your pet door through a wall? I can install your pet door in a wall. Whether you want the pet door through an interior or exterior wall: frame, block, stucco, brick or brick façade, or vinyl, wood or aluminum siding—even concrete foundations! I can install your pet door in a window: double hung window, vertical and horizontal sliding windows, casement window, hopper window, bay window, awning window, even storm window and door replacements. 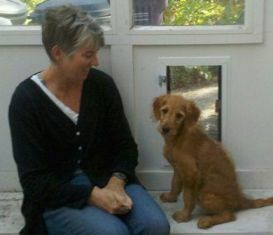 Would you like to use your sliding glass patio door for your pet door? I can measure and install your sliding glass panel pet door in the sliding or stationary side of your patio door. Need a ramp so your pet can safely access the pet door? I can supply you with a custom built, high quality ramp for your pet’s safety and convenience. Freestanding ramps are also available for your pet’s access to vehicles, couches, beds or other areas. Concerned about your dog door’s security? A security barrier is an attractive solution to human intrusion. Your dog can safely access the pet door, but a person will find it virtually impossible to get through the barrier. For more information or to schedule your pet door installation call 720-670-0913 or contact me .